2009 construction plans. Now that the basic structural work on the Surmang shedra (school) has been completed and the building complex is closed in, the focus turns to the large amount of systems and finishing work that is needed. Among the elements needed are electrical and plumbing work, waterproofing treatment of the roof surfaces, the solar heating system, additional exterior stucco, finish flooring, and entrance doors. Beyond that, there is an enormous amount of painting and artwork to be done, plus furnishings. The situation in Tibet has been particularly difficult over the past year. Nonetheless, a lot was accomplished at Surmang last summer, and even more will be done this summer if sufficient funding can be provided. If we can provide enough resources, the residential portions of the shedra complex could be ready for occupancy by the end of this year. Shambhala Triathlons to support Surmang. Sakyong Mipham Rinpoche has personally taken the lead in fundraising for Surmang in the past by running marathons dedicated to Surmang. Now that he has stopped doing marathons, he’s asked the sangha to take over for him in this endeavor. The Shambhala Triathlon consists of sitting meditation, walking, running, or bicycling on behalf of Surmang Dutsi Til and other Tibetan initiatives funded through the Konchok Foundation. A special website for the Shambhala Triathlon has been created at shambhalatriathlon.pbwiki.com. Some Shambhala centers are already planning local Shambhala Triathlons. Please consider sponsoring Shambhala Triathloners—and participate yourself! To help encourage sponsorship, some donors have stepped forward to provide a 1:1 match for the first $15,000 raised by the Triathlons. Support for Trungpa XII Rinpoche and monastics. Funding is also being provided through Konchok Foundation for the living expenses of Chökyi Senge, Trungpa XII Rinpoche. 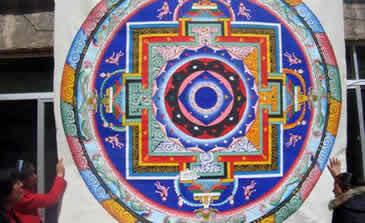 He is presently at Surmang and will return soon to Serta, where he has been receiving advanced teachings. Support for some monks or nuns at retreat centers connected to Surmang is also being provided. Vajrapani mandala thangka for the Surmang shedra main shrine room ceiling. Sponsoring artwork. Preparation of thangkas for the shedra has already begun, thanks to your donations, and those of individuals who are specifically sponsoring artwork. 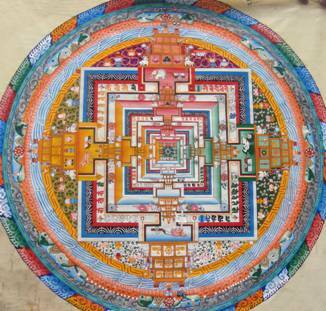 If you would like to sponsor a mandala thangka, the full cost is $500; we are happy to also accept partial sponsorships. Khenpo Tsering Gyurme has assembled a team of fourteen local thangka painters whom we would like to put to work! Educational program for children. Thanks to the generosity of some European donors, a significant educational program for the children of the Surmang valley has been underway for the past few months. More than one hundred children are being taught at the Surmang monastery and two other local sites. Aten Rinpoche is personally supervising this program. Parinirvana Day kickoff for the spring campaign. Appropriately, April 4, the anniversary of the parinirvana of the Vidyadhara Chögyam Trungpa Rinpoche, will mark the start of the spring campaign to support Surmang. 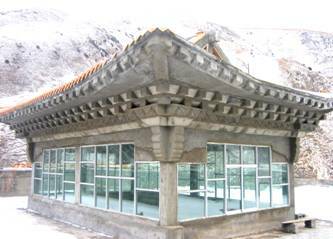 Surmang Dutsi Til is the home monastery of the Trungpa Rinpoches and the Vidyadhara worked very hard to establish a shedra there. Because construction at the high altitudes in Tibet is limited to the summer months, the campaign this spring will largely determine how much work can be accomplished this year on rebuilding the shedra. Your support will be most helpful.